Much has been said about coconut oil, and the current trend is to indicate there are healthy benefits of using coconut oil both for cooking/baking, and skin care. I often wonder why some things come into vogue or go out just as quickly. So i began my research to find out more. Coconut oil is an edible oil extracted from the kernel or meat of matured coconuts harvested from the coconut palm (Cocos nucifera). It has various applications in food, medicine, and industry. Because of its high saturated fat content it is slow to oxidize and, thus, resistant to rancidification, lasting up to two years without spoiling. 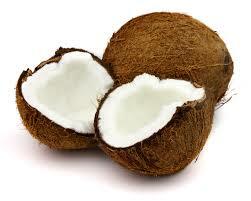 Oil can be extracted from coconuts either using a wet method or dry method. Dry method typically is not used for cooking or cosmetic use, but rather for bio-fuel. Does coconut oil have value in soap? Oh you betcha! The qualities coconut oil brings include super moisturizing dry skin. Coconut oil is an important base ingredient for the manufacture of soap. Soap made with coconut oil tends to be harder than soap made with other oils , although it retains more water than those made with other oils and therefore increases manufacturer yields. It is more soluble in hard water and salt water than other soaps allowing it to lather more easily. The lather is rich and luxurious. A basic coconut oil soap is clear when first saponified and a bright white when hardened and cured. How about cooking with it? Coconut oil contains a large proportion of lauric acid—a saturated fat that raises blood cholesterol levels by increasing the amount of high-density lipoprotein (HDL) cholesterol and low-density lipoprotein (LDL) cholesterol. Most of the increase is HDL cholesterol, hence the ratio of total to HDL cholesterol is decreased. A decreased ratio indicates reduced risk for heart disease. It is also found in significant amounts in laurel oil, palm kernel oil (not to be confused with palm oil), human and animal breast milk, and sebaceous gland secretions. This may create a more favourable blood cholesterol profile, although it is unclear whether coconut oil may promote atherosclerosis through other pathways. Because much of the saturated fat of coconut oil is in the form of lauric acid, coconut oil may be a better alternative to partially hydrogenated vegetable oil when solid fats are required. In addition, virgin coconut oil (VCO) is composed mainly of medium-chain triglycerides, which may not carry the same risks as other saturated fats. Advocacy against coconut and palm oils in the 1970s and 1980s due to their perceived danger as a saturated fat caused companies to substitute trans fats instead of them, unaware of their health-damaging effects. Coconut oil, like all things, should be taken in moderation. And are we using it in our products? Yes, a number of our recipes for soap include coconut oil. We love the rich lather, and how the coconut oil does help the soap to harden, and last longer. We have learned that soap with coconut oil needs to be elevated in the soap dish, and cannot sit in a pool of water or it will begin to break down. Making anything new with coconut oil? Yes, we are in trials now for a bar of soap made using only coconut oil. It is glossy white, and very hard with a light scent of coconut. Research continues to make a tropical bar with essential oils that compliment the coconut scent. More details as they become available.